I love getting to the end of the fortnight and trying to decide on what we’re going to cook with the remaining few things in the fridge and the last few tins in the pantry. Honestly, sometimes it’s tough but mostly it’s kind of a cooking show mystery bag type experience. 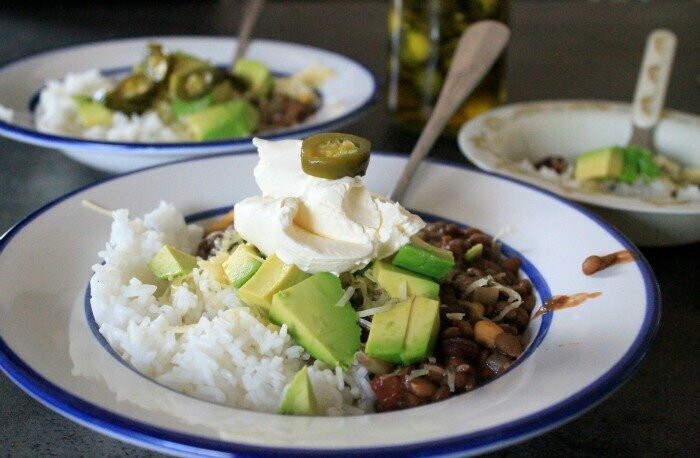 Last week the result was a vegan chilli, which I then topped with rice, cheese, sour cream, avocado and jalapeños. I went out specifically and bought delicious white corn corn chips and forgot to serve them! How annoying! I posted a picture of it on Instagram and had quite a few requests for the recipe, I started typing it but I found it to be a little long, so I thought it’d be better for the blog. What is you favourite chilli topping? In a large heavy based pot, heat olive oil and fry onions until soft. Add garlic, lentils, spices, fry for about 2 minutes or until fragrant. Add stock and crushed tomatoes, bring to the boil, then reduce to a simmer for about 45 minutes. Season well with salt and pepper to taste. Aaaaaaand the decision as to what to cook for dinner tomorrow night has been made! Thank you Clare! Such a great recipe!